To permanently delete a curriculum map, you must archive the map first. 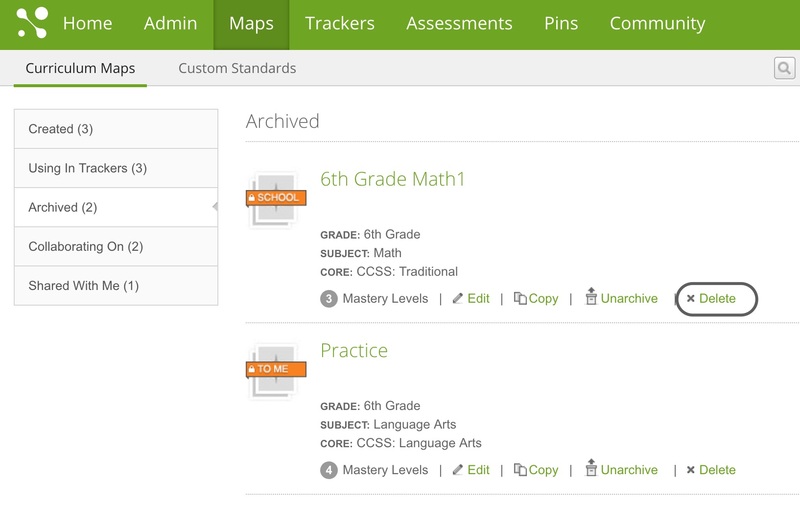 Go to the curriculum map you want to remove, and click on Archive under the curriculum map name. This moves the curriculum map into your Archived list. Click on the Archived tab, then click on Delete. Note: When you permanently delete a curriculum map, the associated standards, assessments, and pins will also be deleted. To remove a curriculum map from the Archived list, click on Unarchive under the curriculum map name. This will restore it to your list of created curriculum maps.